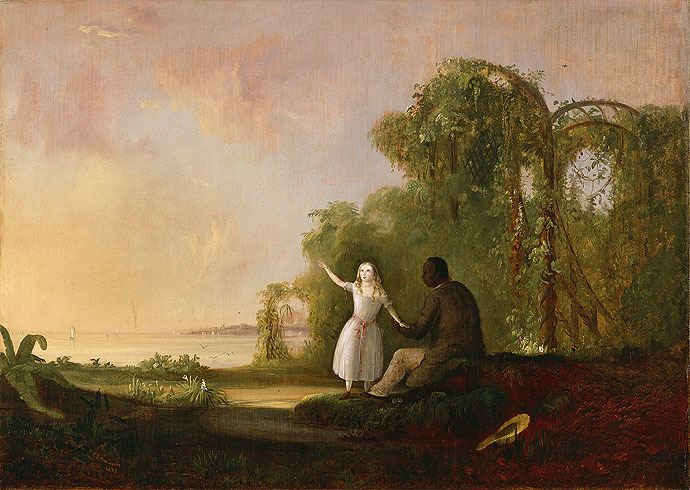 "Uncle Tom and Little Eva"
Robert Scott Donaldson (c1822 - December 21, 1872) was an African American artist. Born in New York state, he did much of his painting in Ohio and Michigan. His landscapes were influenced by the Hudson River School of American art, and much his other work testifies to his commitment to the anti-slavery movement. This 1853 oil painting of Tom and Eva was commissioned by James Francis Conover, editor of The Detroit Tribune. Uncle Tom and Little Eva, 1853.